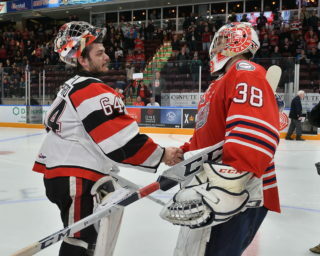 Toronto, ON – The Canadian Hockey League today announced that Liam Herbst of the Guelph Storm is the Vaughn CHL Goaltender of the Week for the first week of regular season action ending September 25 after posting a 2-0-0-0 record with a goals-against-average of 1.00 and save percentage of .974. 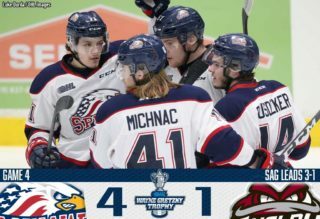 Herbst stopped 75 of the 77 shots he faced in an opening week home-and-home series with the Saginaw Spirit backstopping the Storm to a pair of victories. He made 35 saves on Friday night as second star of a 5-1 victory, then turned aside 40 shots and earned first star honours in a 2-1 Storm win on Saturday. 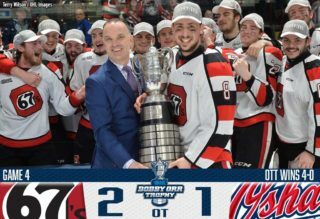 A 20-year-old from Etobicoke, ON, Herbst is playing in his fourth career OHL season and first with the Storm after being acquired in the off-season from the Ottawa 67’s. Herbst was a first round pick of the London Knights in the 2012 OHL Priority Selection after capturing an OHL Cup Minor Midget title with the Mississauga Rebels. 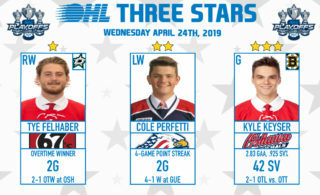 Miller, MacIntyre, Herbst are Saturday’s #OHLOpeningWeek Three Stars of the Night. Also considered for the award this week was Gabriel Morency of the Rimouski Oceanic who made 36 saves in two appearances against the Baie-Comeau Drakkar finishing the week with one win along with a goals-against-average of 0.57 and save percentage of .973. In the WHL, Travis Child of the Swift Current Broncos was the lone WHL netminder to produce a shutout in opening week stopping all 28 shots faced in a 6-0 victory over the Saskatoon Blades on Sunday.